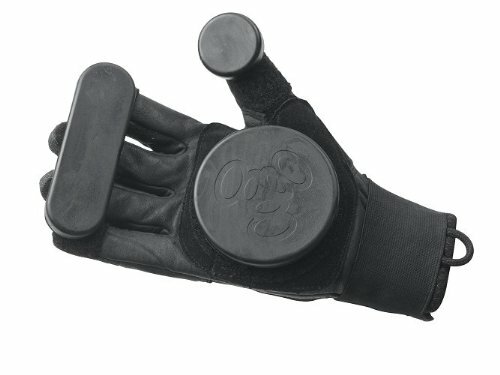 Heavy duty action on the longboard requires sliding gloves that can meet these extreme demands. Beyond protection, the best sliding gloves allows any longboard rider to do execute tricks and exhibitions confidently – an almost impossible feat to do with bare hands. 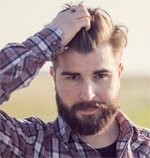 You may think that you may not find the need to use it, until you get that urge to step up your game and do the slide. When you do, you will want to have sliding gloves ready for those advanced moves that demand competence from your hands. Usually, if you are just starting out in longboarding, using gloves may not be your priority. Eventually, as you improve your skill, you will understand why it is essential to have a good pair of sliding gloves. These are the best longboard accessories you will invest in. Your choice of slide gloves can either improve or damage your longboard experiences. One example is when a rider stretches the arms backwards and the hand comes in contact with the ground to support the body, this will need ample protection. The shift of gravity is changed and the hand will help keep the balance. The sliding glove protects the hands. But the excellent sliding gloves will help you manage that awesome slide throughout its entirety. 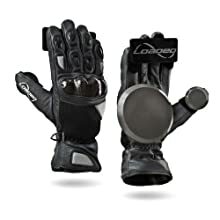 The best longboard slide gloves will basically keep you injury free whether you are a beginner or an advanced rider. What make a slide glove distinct are its unique parts specifically designed for longboarding. There are particular parts of a slide glove that make it special: the main glove, the puck, and the wrist strap. It is the main material that covers and protects your hand. The ideal slide glove is made from flexible, lightweight, most importantly, durable material. High quality sliding gloves come with tougher material set on the knuckles area for more protection. The puck is the toughest part of the glove, since this is the one that touches the ground especially during longboard slides. Being the part that takes the impact and friction against the road, this is constructed from plastic or other hard material. There are variants of pucks that are made from softer material. While these may be more comfortable, these tend to wear out quickly, eventually resulting in a bad performance. The quality of the puck will often help you recognize between a quality slide glove from a substandard one. As with many sporting gloves, the wrist strap functions to adjust the glove to snugly fit the wrist area. This prevents the glove to fall off as it also provides the needed support on the wrist during slides. The makers of Loaded Freeride Gloves Version 7.0 came up with this slide glove design based on the feedback of longboarders. Now constructed from abrasion-resistant Cordura®/Kevlar®/synthetic suede, it is a pair made more durable than ever. The Coolmax® lining and vented mesh provide the breathable comfort needed. Most importantly, the Poron XRD® palm padding and viscoelastic foam knuckle pad give the ultimate protection during slides and longboard tricks. The pucks are removable and can be stored away if not needed. This type of gloves is available in three sizes, which makes it great for youth and women. One main concern is the size that runs too small for larger hands. Designed with the extreme durability in mind, the Loaded Longboards Goatskin Race Slide Gloves deserves its title as the best sliding gloves in the planet. The high-quality goatskin leather provides the durability needed for those extreme moves during riding. The fingers and knuckles are protected by the carbon knuckles and finger protectors for optimal support during sliding and rag dolling. This pair of gloves is great for small to medium-sized hands. Riders with extra large hands will have to look somewhere else. This is priced among the more budget-friendly slide gloves but performs decently well. Thus it deserves to have its place in this list of best slide gloves. 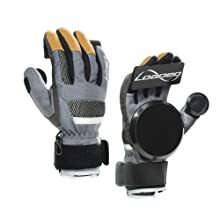 With breathable fabric and super strong Velcro wrist strap, it comes with removable slider pucks that also includes a thumb. Andux also added another slider set in case replacement would be needed. Experienced riders should give this is a good look and consider this brand. In striking colors, Sector 9 Slide Gloves coming from the reputable manufacturer of longboards, definitely catches the eye. The features make it a great choice for new riders. It provides a decent amount of protection, anti-vibration, and high-density grip all packaged in a comfortable and breathable neoprene material. Users praise it for its great performance and fit. Triple 8 Slider Gloves boast of its tear-resistant Kevlar fingertips which will protect your digits even during the roughest slides. If that is not enough, you can buy an extra set of pucks and slider bars sold separately. Whether for cruising of downhill slides, the Triple 8 Sliders will never fail your ride or your tricks. Excellently durable, the gloves are made from top-grain leather that will last you for many, many rides and slides to come. 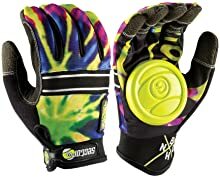 Choosing the best longboard slide gloves can be difficult if you only look at the appearance. To help you with your decision, you go for the one chosen by users based on the highest ratings. The Triple 8 Slider Gloves owned its rightful place in this list of best sliding gloves in the market today. Apart from its excellent performance based on reviews, it comes in an affordable mid-range price and a neutral appearance that can match any outfit. A great ride should be matched with a great glove. To keep going and enjoying more cruises, downhill slides, and longboard rides, you need to take good care of your hands and fingers. 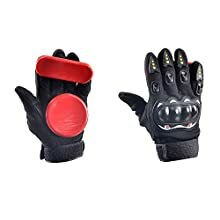 These gloves will bring your skills several notches higher knowing your safety is ensured as well as the flawless manoeuvrability that will not be possible without the perfect pair of longboard sliding gloves. Apart from having gloves for safety you can also attach best longboard accessories lights as it will help you getting noticed in darker areas. It will also help add style to your longboard ride.